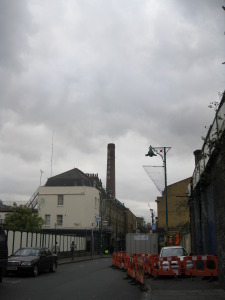 Half way down Brick Lane, the Truman brewery’s towering brick chimney, on the corner of Hanbury Street, is both symbol of born again Brick Lane and a marker of the beginning of new territory. Since 1998, when it stopped producing beer, the Truman Brewery building has been a creative centre for designers, architects, artists, musicians and artisans. New couturiers present their creations at weekly fashion markets. The annual Free Range Art Exhibition of Youth Art and Creativity, “the world’s largest art happening”, shows the work of young art and design graduates. In the old Truman Brewery, days are easily lost among the 11 acres of galleries, showrooms, shops, cafes and restaurants. Nights are easily lost too in Truman’s clubs. Shabbily chic Vibe Bar has a DJ, corners with tatty couches to collapse on and a cool courtyard to retreat to. At 93 Feet East, fantastic live music, which includes debutants along with big names like White Stripes and Radiohead, entirely eclipses the décor. It’s worthwhile losing days and nights in the Truman Brewery!